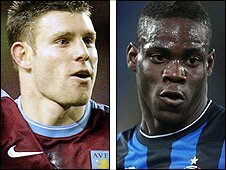 Manchester City say they hope to complete the signings of Aston Villa midfielder James Milner and Inter Milan striker Mario Balotelli by Thursday. On Friday, Villa manager Martin O'Neill admitted Milner was on the verge of a big-money move to Manchester City. Villa rejected a £20m bid from City for Milner in May and put a £30m price tag on the England midfielder. "We are close with both players but now they are going with their national teams," said City boss Roberto Mancini. Milner is set to link up with the England squad ahead of Wednesday's friendly with Hungary while Balotelli has Italian national commitments as well, although Mancini is hoping to tie up both deals very swiftly once those midweek fixtures are over. "We hope that we can have these players by next Thursday," added Mancini. "For now we have two days off and we are not going to talk about the market. Next week we will see. These deals could happen but we need to wait." Should both deals go through it would take City's summer spending beyond £125m and confirm their status as the richest club in the world. If Milner does complete his move to City it will bring to an end their summer-long pursuit of the 24-year-old, something O'Neill thinks would be good for both clubs. "I think for everyone's benefit it is probably time to try and get something done," said O'Neill on Friday. Mancini also revealed he will shortly meet with forward Robinho to discuss his City future. Robinho, who cost a British transfer record £32.4m when he arrived from Real Madrid in 2008, has just completed a six-month loan spell in his native Brazil with Santos. Despite Robinho suggesting that he is keen to remain in Brazil, it is unlikely that Santos could afford to sign the 26-year-old on a permanent deal. Mancini has admitted he is anxious to speak with the striker, who shone at this summer's World Cup, after he returns to the UK from New Jersey where Brazil take on the United States in a friendly on Wednesday. The Italian, though, played down suggestions that Robinho could be used as a makeweight in City's attempts to capture Balotelli. It is believed Balotelli, who was frozen out in the latter part of last season by former Inter boss Jose Mourinho in the club's historic march to a treble of Italian league, cup and Champions League triumphs, would cost City in the region of £24m.